There are many situations where you will want to use the date or the time within your application. Maybe you had a database application and want to store the date whenever you add a record, maybe you want to create a to do list, maybe you just want to time how long something takes. LiveCode has built in functions for getting the date and time, in a range of formats. This lesson will show you how to use them. But what if the date isn't in the format you are used to, for example that date above is in the form m/d/y but here in the UK the more common form is d/m/y. put the long date into field "long"
put the abbreviated date into field "abbreviated"
put the short date into field "short"
put the english date into field "english"
put the system date into field "system"
put the internet date into field "internet"
put tDate into field "Christmas Day"
put tMyFormattedDate into field "formatted date"
put the long time into field "long"
put the abbreviated time into field "abbreviated"
put the short time into field "short"
put the english time into field "english"
put the system time into field "system"
Again this is the same as converting the date, just using the time instead. put tTime into field "Converted Time"
put tMyFormattedTime into field "formatted time"
Prev: What Are The Alternatives To Using Global Variables? intuitively you may expect so, but "the english date" refers to the US english date, where the data is commonly represented as month-day-year. How could I get livecode to calculate elapsed days or time from a given date or time? 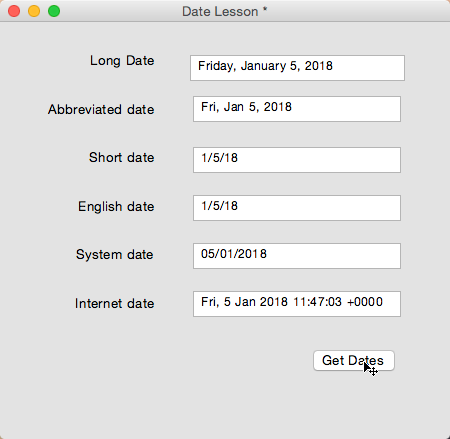 You can calculate the number of elapsed days between to dates by converting the dates into seconds, working out the difference and converting the number of seconds into a number of days. Check the convert command and seconds keyword in the Dictionary. answer tDifferenceInSeconds / (60 * 60 * 24) && "days"
You can do something similar with the time. This does not work if there is a daylight saving time between the two dates. So...how is it possible to always have a day difference between two dates? If you calculate the difference using midday rather than midnight the number of days comes out correct. The reason that 0100:44 is not converted is that it is an invalid time, if you check the result after the convert command it will say "invalid data" and the original time will be unchanged. When using the format function if a charLength is specified, if the string is shorter than the charLength, enough leading characters are added to make it charLength characters long. If the length of the string is equal to or greater than the charLength, it is unchanged. We will look into writing a more detailed lesson on time parsing but if there is something specific you are trying to achieve right now please let me know and I will try to help. I store this in a function and call it whenever needed. So, still trying to work out how to use the old unix timestamps our database has. I suppose I could covert everything and store it in a different format, except I have a lot of code rewriting to do, and as fast as live code is, that would take me many months. Our database stored everything as a unit time stamp, seconds from midnight(utc) Jan 1st, 1970. Now I need to be able to access the information with live code, both reading and writing data to the database. Any ideas? Returns 10:13:20 AM, where the seconds was originally 1548065600. You can do the inverse if you want to write seconds back to the database. Have a look at the entries for seconds and convert in the Dictionary for a bit more information. 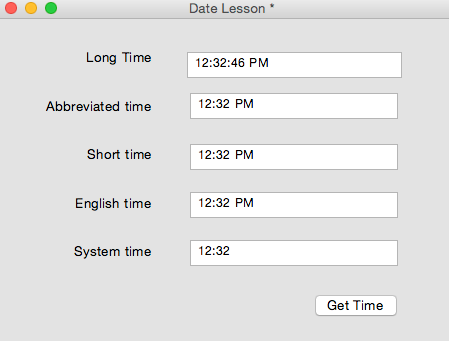 I guess what's confusing me is how to set are arbitrary time and date at the same time... I can set the time or date, how do I set both for a day back in December for example? I tend to use the dateItems to work with date and time at the same time. This is described in the "Formatting the date yourself" section of the lesson. So you could take the seconds from the database, convert to dateItems to get the year,month,day,hour,minute,second,day of the week and then format that for display however you need. You can do the inverse to update the database.